A 1-1 Week 15 is done and over with, with Green Bay (+6) failing to get through the Pack door for us yet again in Chicago. Tennessee (+2) more than did their part, shutting out the Giants in East Rutherford after seeing the line move five points towards our pick. The last time a number moved in the opposite direction of these printed picks was Week 10, so hopefully, some positive regression is in order for Week 16 and beyond. With the Bengals over 5.5 (finally) hitting, we’re 20-17-1 on our “Lock of the Week” picks since the start of 2017 (54.1%), with two win totals pending. 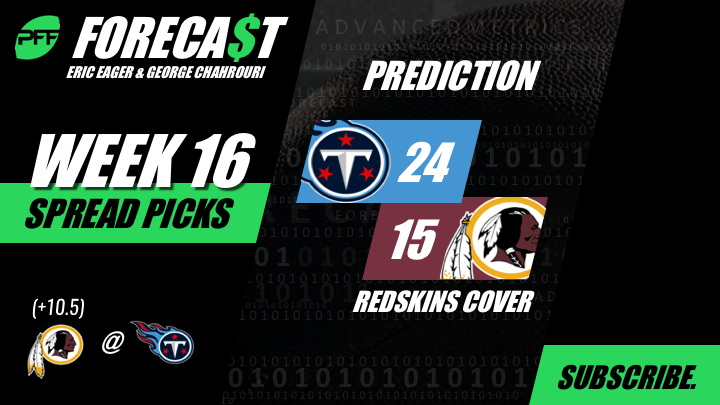 Tennessee (+2) was slated to be our Lock of the Week for Week 15, but when the number moved through zero and out to Tennessee (-2.5), we did not post a pick for the week (and will not count TEN (+2)). The analyses below will involve a point-counterpoint between the two of us for both picks, using perspectives that only the PFF grades and data can provide. Follow us on Twitter at @PFF_Eric and @PFF_George, and for some podcast commentary on some of these picks, and the process that goes into them, give the PFF Forecast a listen. We will have a special Monday morning podcast each week with look ahead lines for the upcoming week. Point (Eric Eager): This is something of an ugly duckling that has been the staple of backing the Washingtons this season. The Titans are clearly the better team here, with an obvious path to the playoffs to play for (their playoff probability is 53% with a win and just 16% with a loss). However, that doesn’t make them a great team, coming in at 11 in our PFFELO rating system only because it is difficult to find 10 teams better than them. Marcus Mariota has the most clean-pocket interceptions in the league over the last two seasons, and Washington is more than capable of taking advantage of such foibles on the back end, as Josh Norman, Ha Ha Clinton Dix, and D.J. Swearinger VIII have combined for seven interceptions and another 10 pass breakups between them. Only 38.8% of early-down runs against the Breadsticks have been successful through the season’s first 14 games, so Derrick Henry should be sufficiently neutralized after two big games. On the other side of the ball, look for Josh Johnson and Adrian Peterson to fulfill the destiny of a game that is lined with an over/under of 37 points, and produce close to the 16 points they scored against a better Jacksonville defense last week. If they do so, it should be more than enough to cover double digits and keep their playoff chances (32% if they win outright) alive at least for the first few quarters. Counterpoint (George Chahrouri): Does Colin Kaepernick Josh Johnson have what it takes to score more than 10 points on the road? Let us assess. No quarterback has made a positively-graded throw less frequently since week 14 than Johnson. Meanwhile, the Titans need a win to keep their playoff hopes alive in the Music City, and they sport a defense that ranks sixth in first down conversion rate. The Spreadskins may be forced to watch a quarterback take a knee on their playoff hopes in a wonderful twist of fate. Jackson targets tight ends on 25.0% of his throws (sixth-highest). Derwin James was picked at 17 after teams inexplicably passed him up for the likes of Bradley Chubb, a 35-year-old tackle, Kolton Miller, and two defensive tackles. Derwin James has been the most valuable defensive rookie this season (using PFF WAR). James has allowed a passer rating of 16.7 when in coverage against tight ends, and that is the best among safeties. He would also be the best pass rusher on most NFL teams. Prayers and thoughts. Counterpoint (EE): While the Chargers have been the best team against the pass on early downs from an EPA perspective so far (allowing -0.02 EPA per play), they are allowing successful runs on over 41% of early-down attempts — one of only four AFC teams to do so through 15 weeks. Lamar Jackson has been dynamic on both designed runs off tackle (6.2 yards per carry) and on scrambles (7.6), while Gus Edwards has been brilliant himself (5.0 yards per carry, 3.3 after contact) when they have chosen to go his way. If they can successfully employ the same game plan that they had against the Chiefs in Arrowhead two weeks ago, laying these four points might come back to bite us (and in the worst way, given our hatred of the running game). Point (EE): Hey, we’ve spent the entire season doubting the Texans, and while they have exceeded our expectations, they have done so with a bottom-five schedule in the league, grinding out wins against the Bills, Broncos, Breadsticks and the Jets. While DeAndre Hopkins will offer a lot of difficulties for the Eagles’ patchwork secondary, their front four was an absolute terror for the Rams last week, pressuring Jared Goff on 17 dropbacks (only seven completions on said dropbacks). Houston’s offensive line is far worse than Los Angeles’, and Deshaun Watson has been above his skis a bit in such situations (86.5 rating, fourth-best among quarterbacks). 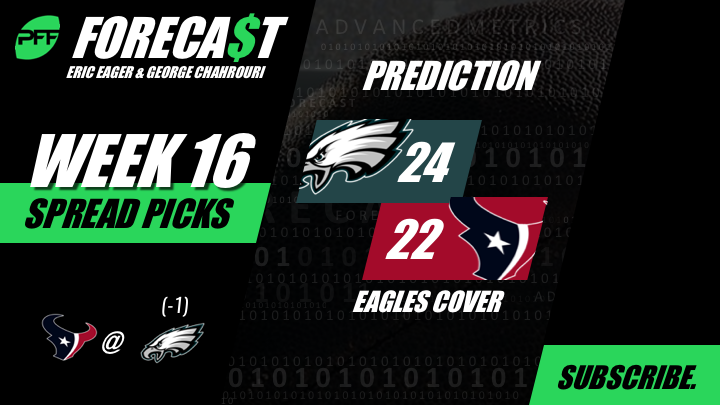 We know pressure statistics are unstable for quarterbacks, so look for the Eagles to suppress Watson a bit at home and give Nick Foles an opportunity to give Alshon Jeffery chances downfield against the aging Houston secondary. Counterpoint (GC): Super Bowl Champion Nick Foles is a God-fearing man who doesn’t look at the scoreboard or worry about the clock, and just like another Nick who gets called out of hibernation in December that is probably for the best, because each has to make-up for lackluster supporting casts. The Eagles’ coverage may not have any actual elves, but they are struggling nonetheless. Since Week 10, they are one of two teams to allow a completion rate over 70% (Carolina is the other). Foles has played three games this season and managed a sweltering 81.0 passer rating from a clean pocket. Fletcher Cox and the defensive line may be the best in the league but they can’t pass or cover DeAndre Hopkins. Point (GC): “The better quarterback getting four points” is written on my Christmas list and look what we have here. No quarterback has made turnover-worthy plays at a higher rate than Ryan Tannehill this season, and that plays perfectly into the strength of the Jaguars’ offense, which is to get an interception then utilize their quarterback’s unique talent (handing the ball off to an already half-tackled running back). To top it off, Tannehill is dealing with an ankle injury which should make “taking the next step” a real challenge this weekend, so we may have to wait for next season when he will be playing with Perry Ellis on the under-40 YMCA All-Stars. Xavien Howard is also questionable, and he is actually playing well enough for this to hurt the Dolphins’ chances. The Jaguars probably can’t take advantage of this, but I’m noting it anyway because there isn’t much else to discuss; I wouldn’t trade Jalen Ramsey for the entirety of the other players in this game. Counterpoint (EE): The Jaguars fall into the category of “cooked,” having the distinction of being the only franchise in NFL history to have lost a game started by Josh Johnson. While their defense is relatively healthy, and remains statistically good, their “starting quarterback” Cody Kessler has been worse than Blake Bortles since taking over last month, with an egregious 1.90/3.90 big-time throw/turnover-worthy play ratio to go with his 5.3 yards per attempt (better than only Josh McCown and Mark Sanchez during that stretch). While Ryan Tannehill has played poorly relative to his 5-4 record this year (and relative to the rest of the league, if we’re being fair), the Miami offense has been able to overcome his poor play through yards after the catch and good coaching from Adam Gase. If they continue these trends in an environment where they still have a 6% chance to make the playoffs (and have a sneaky tiebreaker against Tennessee), then they could win this game handily and cover the points. Point (EE): This was a better pick when it was a pick ‘em (prior to Aaron Rodgers declaring that not playing meaningless games was somehow worse for team morale than throwing the ball away on 100% of his dropbacks). However, our numbers still like the Packers in this spot. They are currently 0-7 on the road, with a winless season something I’m not sure I can envision from a team quarterbacked by a future Hall of Famer for all 16 games. Couple that with the fact that Sam Darnold’s last two games (our second-highest-graded quarterback during that stretch) are starting to grow on people like a mole on one’s face, and you’re still likely buying one team near the bottom of their market while selling another at the top of theirs. Rookie Jaire Alexander (74.1 PFF grade) should be able to take away the one true threat the Jets have in Robby Anderson (64.2), leaving a struggling offensive line to deal with what is (even while banged up) a good front seven for Green Bay. With the Jets’ offense sufficiently held in check, hold your nose and go with an all-time great here in this spot. Counterpoint (GC): The GOAT knows that a hall of fame career is not made by throwing risky passes in a lost season. Rodgers continues his assault on the history books with many passes to the cameramen and women 10 yards out of bounds. Meanwhile, Sam Darnold obviously learned a very important lesson at USC; being talented and playing well at the end of the season is literally all you have to do in a big media market in order to win the off-season. 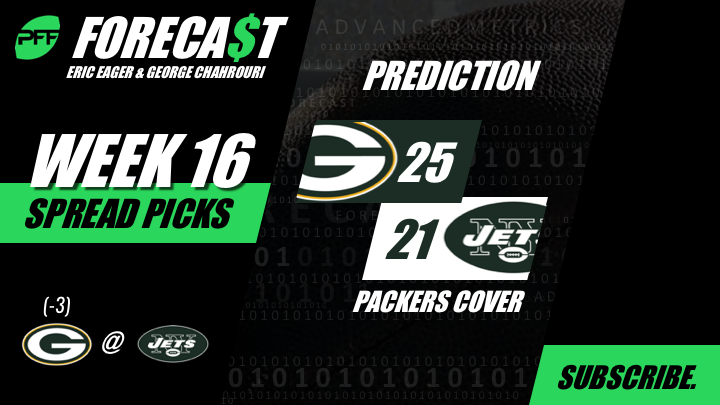 With a huge win in their first playoff game, the Jets move onto the conference championship round where they will play all out and the Packers will do everything not to hurt their bodies or the absurdly-high Super Bowl 2020 odds and 11-win Vegas totals that are sure to arise in mid-July. Darnold managed a season-high positively-graded throw rate last week, that is really the only positive stat I have for a game that is only going to be watched by bettors and completely realistic fan bases.